ToyRAP is a new project which is based on 28BYJ-48 stepper motor making it extremely cheap, it can be built for some 75 euro. It is aimed at education and demonstration purposes. ToyREP is a tiny and inexpensive FFD 3D printer designed mostly as a technology demonstrator or child's toy. The print volume is 100x100x100mm (125x125x100mm with some upgrades) with a cold bed made of polyacrylate. Hot end is a E3D clone for 1.75 PLA or ABS filament with 0.4mm noozle. 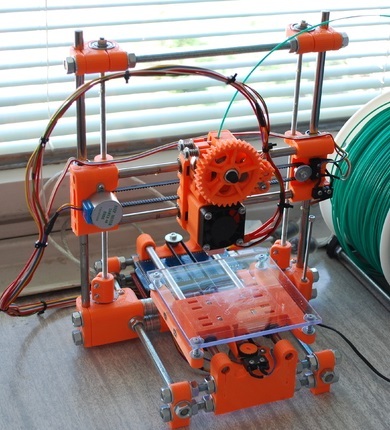 Using very cheap 28BYJ-48 stepper motors (with Bi-polar hack) in all axis and geared extruder, Arduino Mega 2560 with Ramps 1.4, DRV8825 and modular RepRap construction based on Mendel, Printerbot, Cherry, Prusa i3 and CARP Box ideas. Frog for print area 125x125mm - uploaded to ToyREP. Bowden extruder mount - uploaded to ToyREP. ZMAX without 608ZZ bearings (to prevent wobbling) - uploaded to ToyREP. Make X1, X2 compatible also with M8 threaded rod or belt driven Z axis instead of threaded rod to speed up Z movement.